I’m thrilled that tomorrow is the first day of fall! Now, if only the weather here would cooperate with the season, all would be right in my world. Today feels like summer with the 85 degree weather! That hasn’t stopped my work in the kitchen though. The leaves are falling and I can feel the season changing so I have already welcomed fall into my home. Heck, we are a little over 5 weeks away from Halloween so if I could get a few more days cool enough to wear layers, that would be great. Ok, Mother Nature? I’m sure I’ll look back at this post in February and curse myself for wanting cooler weather though. 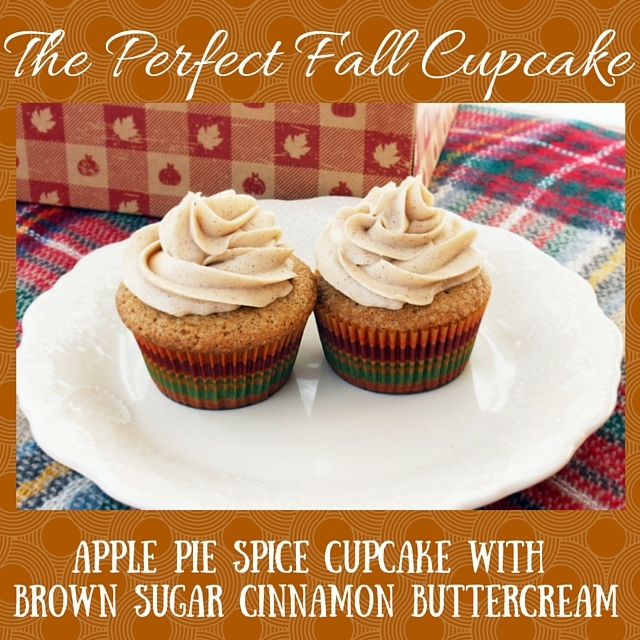 Today’s recipe is a lovely dessert: Apple Pie Spice Cupcake with Brown Sugar Cinnamon Buttercream. 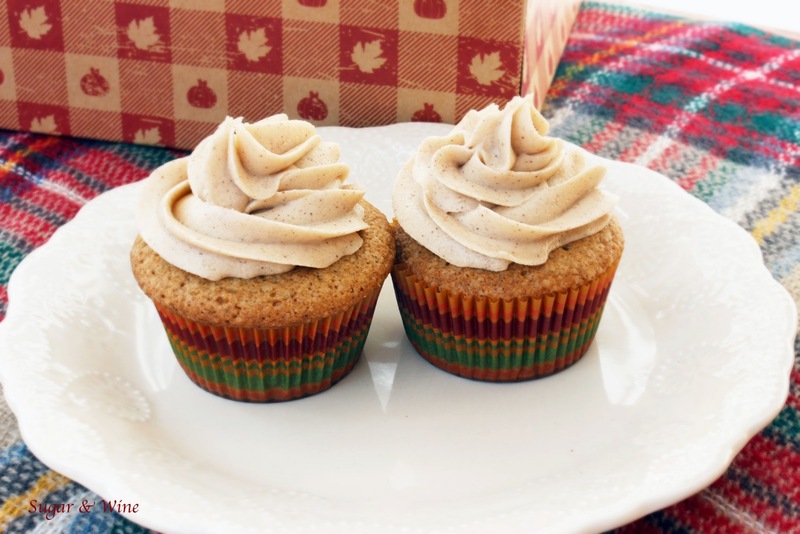 The cupcake is a light spice cake that is both savory and sweet. The filling is basically the inside of an apple pie. And, then to top it off, there’s a brown sugar cinnamon buttercream. This is the cupcake to make this fall. I’m not going to lie: this isn’t a light cupcake. It’s definitely a statement cupcake that screams fall baking. The buttercream is perfect because it adds a light sweetness to the cupcake without being overwhelming. The cake and the filling are really the stars of the show though. I also tried the cake without the filling inside and its pretty dang delicious too. So, if fillings aren’t your thing, skip it and it will still be a great cupcake. Starting with the apple pie filling, peel, core and dice the apples. In a saucepan on medium heat, melt the butter. Stir in the sugar and cinnamon. Add the apples and let them cook, stirring occasionally until tender (approximately 10-12 minutes). Once done, set aside to cool. Pre-heat oven to 350 degrees. In a stand mixer bowl, cream together the sugar and butter. Mix in the eggs and vanilla extract. In another bowl, sift together the baking soda, flour, salt and spices. Add half the dry ingredients to the wet mixture, mixing until incorporated. Add the remaining dry ingredients until completely mixed, scraping the sides to ensure all the ingredients are completely incorporated. Line two baking sheets with cupcake liners (or repeat the process if you only have one) and fill them half way with the cake batter. Cook for 18-20 minutes depending on your oven. Once finished, let them cool before filling or icing them. While the cupcakes are in the oven, cream together the butter, brown sugar, cinnamon and vanilla extract in a stand mixer. Add two cups of powdered sugar (one cup at a time) and mix. Add in all three tablespoons of milk and mix. Then, add in the remaining cups of powdered sugar and mix until all ingredients are completely incorporated. Once the cupcakes are cooled, use a paring knife to cut out a circle in the middle of the cupcake. You do not want to cut all the way down because the filling would then ooze out. Go about half way through and when you extract the middle pinch off the inside of the cupcake and save the top. Fill the cupcake with about a teaspoon of filling and place the top of the cupcake back over the filing. Finish the cupcake by icing it!